There are 4,543 words in the original, unamended U.S. Constitution, minus the names of the signatories. Is it possible that anyone at any time could write a document of this length and not have a lapse or two of clarity? Doubtful. Even the master of certainty, Donald Trump, acknowledges that he is not quite sure what the meaning of “natural born citizen” is. Of course he uses that to his advantage as he encourages his current top opponent, Senator Ted Cruz, to get a judicial clarification on whether he is a natural born citizen, and thus qualified to be President of the United States. It’s a moot question; a standing verdict could only be determined if Cruz was elected president and someone filed suit to challenge his legitimacy. (Cruz was born in Canada but his mother is a U.S. citizen). Scholars have argued for centuries what is the exact meaning of the Second Amendment. The fact that intelligent individuals have argued over the years about it is a pretty good indicator that there is indeed a lack of certainty about its wording. But in the current debate, virtually no one challenges the notion that the Second Amendment guarantees for Americans the right to own guns. This is not only true for the NRA or conservatives or Republicans, but also for Democrats and progressives including President Obama, Hillary Clinton and Bernie Sanders. President Obama acknowledged as much in his January 7 Town Hall meeting on guns. Conservatives have defined the conversation in such a way that the implicit ambiguity of the Second Amendment is not up for discussion. Even gun control advocacy groups such as Everytown for Gun Safety and Stop Handgun Violence do not challenge the wording of the Amendment. What those who want stricter gun control legislation advocate is restrictions on gun ownership in the interest of public safety. This can be difficult to do because nowhere in the constitution is public safety guaranteed. The Declaration of Independence talks about what is necessary to “effect their Safety and Happiness,” but those two terms were left out of the Constitution except with regard to a Writ of Habeas Corpus. 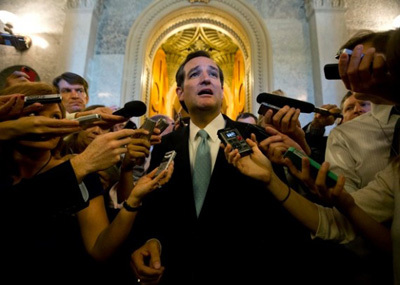 If the issue of a “natural born citizen” becoming president was ever taken to the U.S. Supreme Court, there could be a simple straight up or straight down answer as to whether Ted Cruz would meet that requirement to be president. Yes, it would be subject to further rulings, but for the time being there would be certainty. The conditions that existed when this phrase was written in 1787 are still the same now. That cannot be said for the Second Amendment. Our ability to talk about “common sense gun legislation” might be enhanced by progressives first seeking a “common sense clarification of the Second Amendment.” I’m not sure that the Courts could be of much help in this regard, but perhaps amending the Amendment would help by spelling out clearly who could have guns and who couldn’t, and for what purposes. This might be wishful thinking, but until we put the wording of the Second Amendment on the table, we will be very limited in what we can do to curb gun violence.